Want to see one of the most amazing places in France? 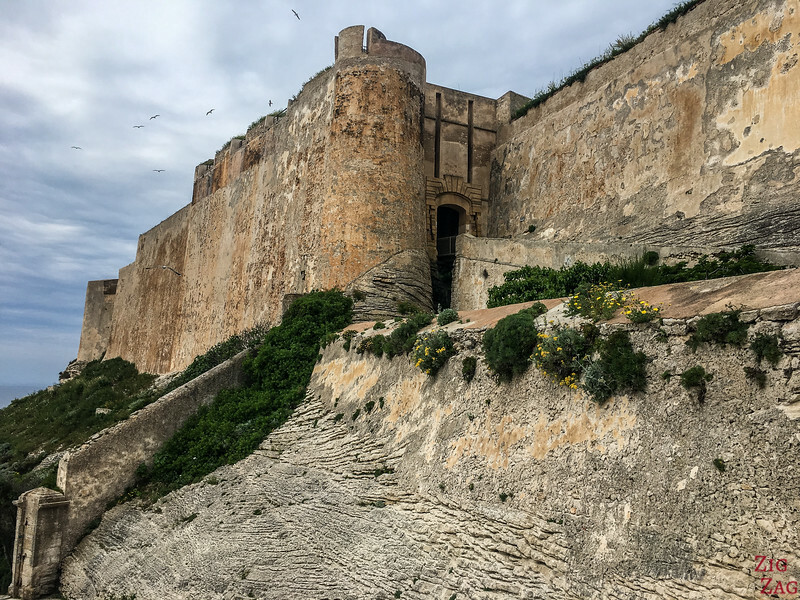 Below is my guide with the best things to do in Bonifacio Corsica (with many pictures): old town, fortifications, white cliffs, boat tours, crazy staircase, Lavezzi islands... The best landscapes and the most unique town setting! 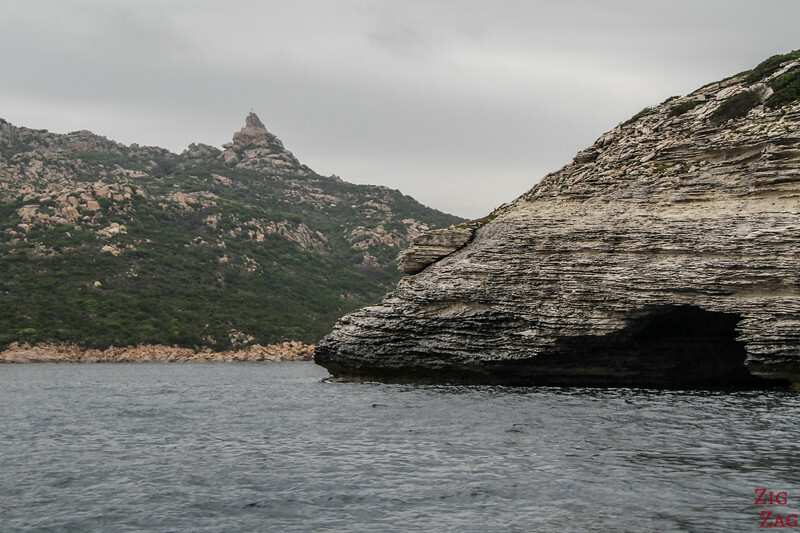 Can you understand now why it is one of the best places to visit in Corsica? 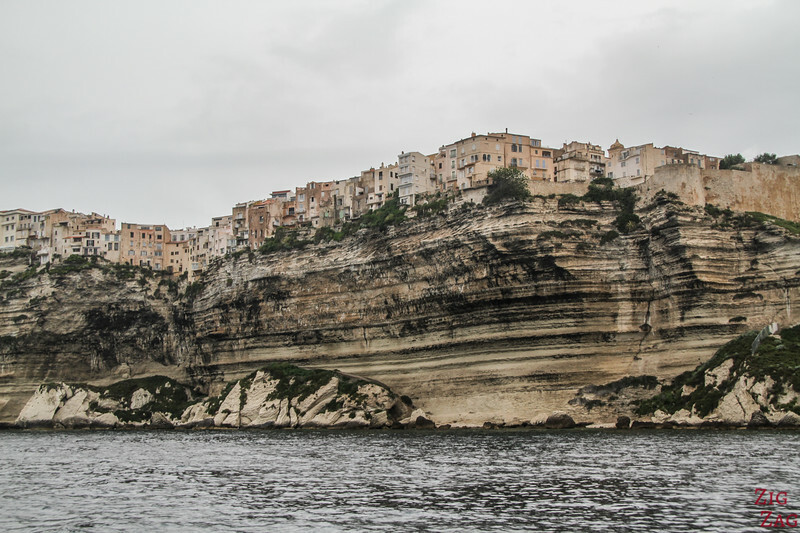 Bonifacio is located at the South tip of the island of Corsica in a protected region called 'les bouches de Bonifacio'. 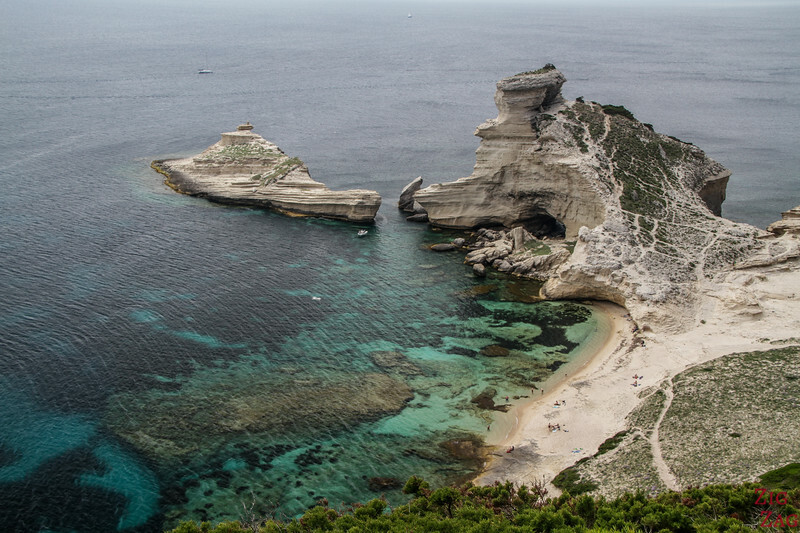 It is in the Mediterranean Sea separated from Sardinia (Italy) by the straight of Bonifacio. Surprisingly, despite being on a narrow peninsula and being an old town, driving up to the end and parking is quite easy. 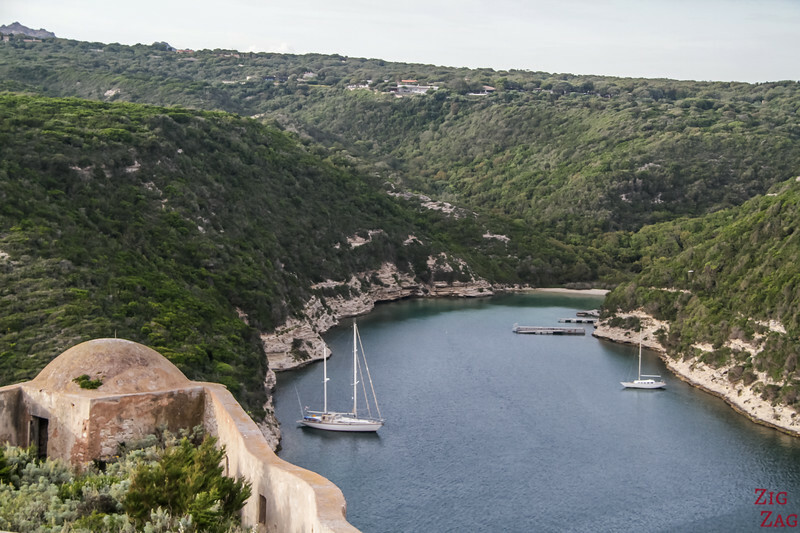 If you have only a weekend to spend in Corsica, you can fly in Figari, take a cab to Bonifacio and enjoy the unique site. 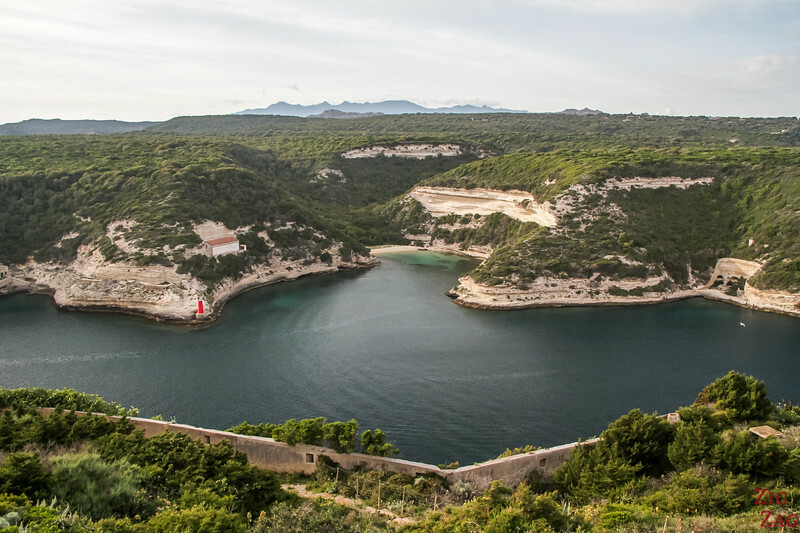 If Bonifacio is a stop on your Corsica road trip, you should plan a minimum of 1 full day but 2 is better. It get extremely crowded during the Summer months. On those days, come early to find a place to park. 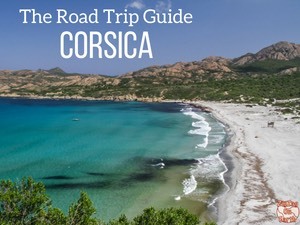 As I said, I recommend you stay at least one night in Bonifacio Corsica but I think the ideal on a road trip is to plan to stay 2. 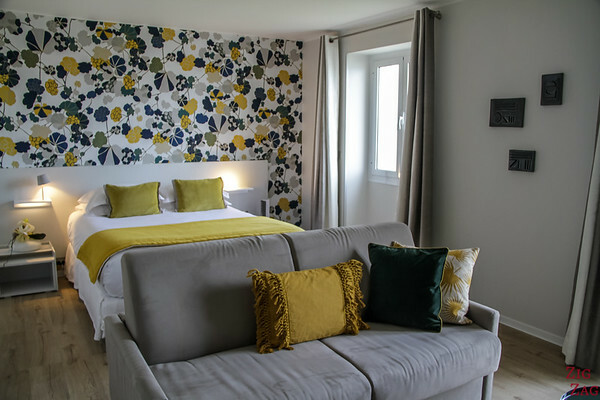 There is a large choice of accommodations in the old town as well as around the marina or a little further away. 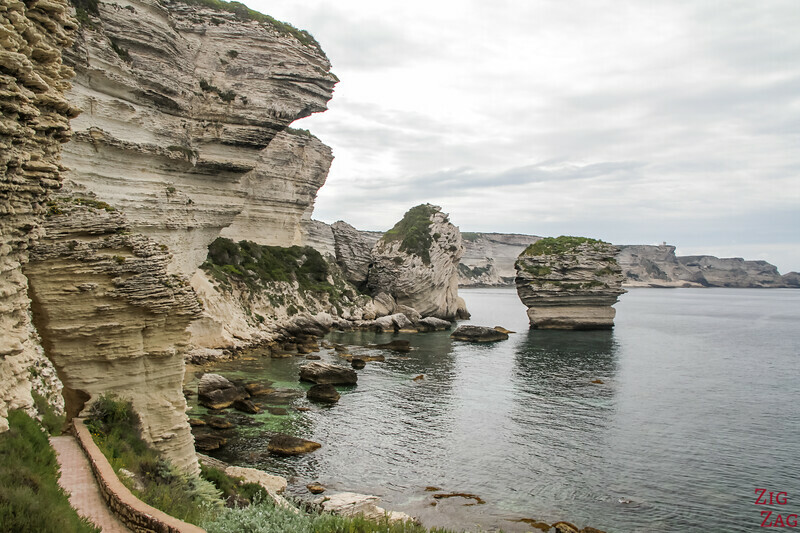 Bonifacio is one of the most magnificent places I have had the chance to see on my travels. The whole area is undergoing Unesco Heritage classification. 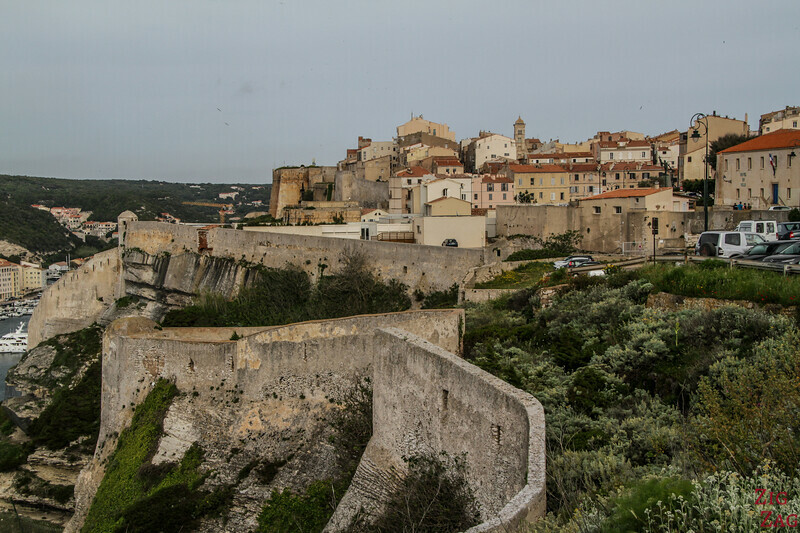 Imagine: The old medieval town is perched on 70m high white limestone cliffs! The white cliffs are very different from the other landscapes in Corsica. 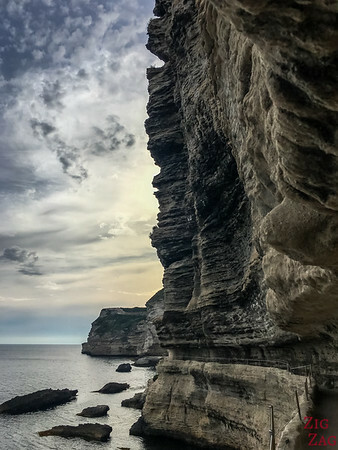 The area is made of white limestone deposited when sea level rose 20million years ago when the plate forming Corsica and Sardinia separated from Europe. They are 70m high and straight. They change colors throughout the day depending on the light. 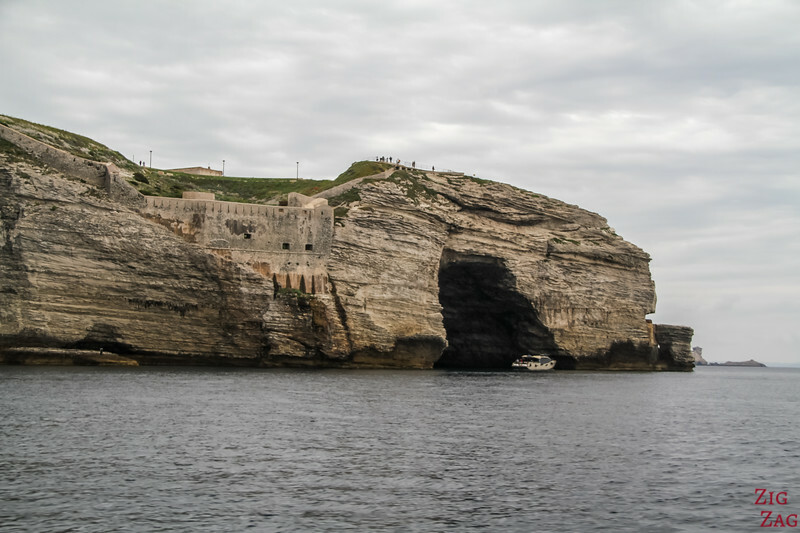 What is unique about the place is not only the fact that the citadel is perched high on those cliffs, but shape of the 1.5km long peninsula and the protected harbour it has created. The Sea between Corsica and Sardinia is quite dangerous as the 2 islands once were joined but volcanic activity separated them. 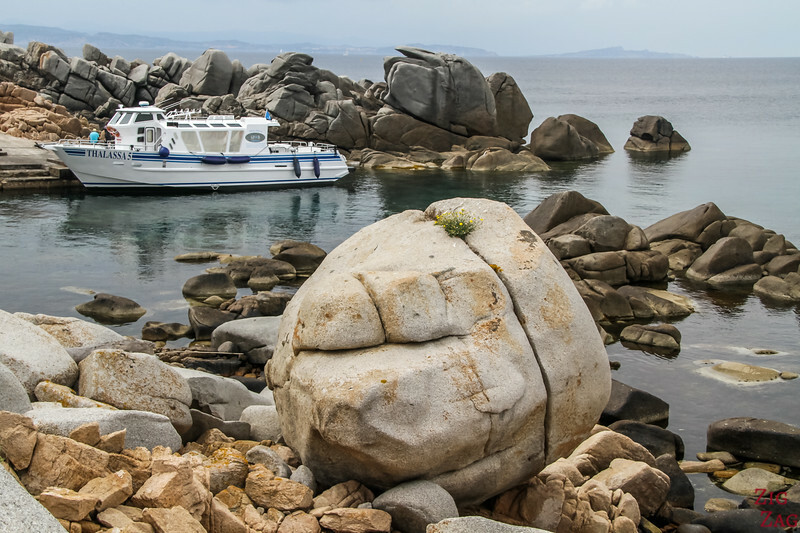 This left huge granite rocks hidden in the water in an area that gets strong wind. The deep harbour entered by a 250m wide mouth is really a fantastic place to enter. The most fascinating part is the Old town on the promontory. 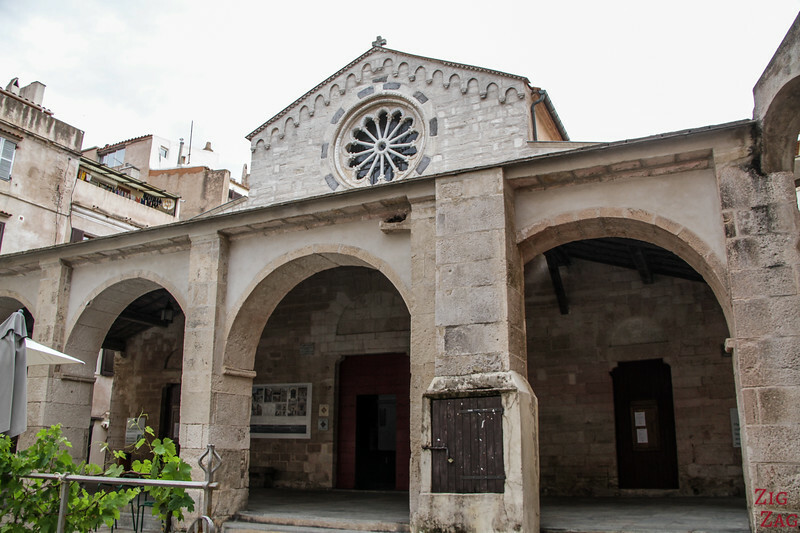 The foundations date back to the 9th century but it has been rebuilt and renovated many times. It takes its name after Boniface II of Tuscany. The views all around the Citadel are exceptional. Even looking inland you see hidden beaches and the mountains of South Corsica in the distance. 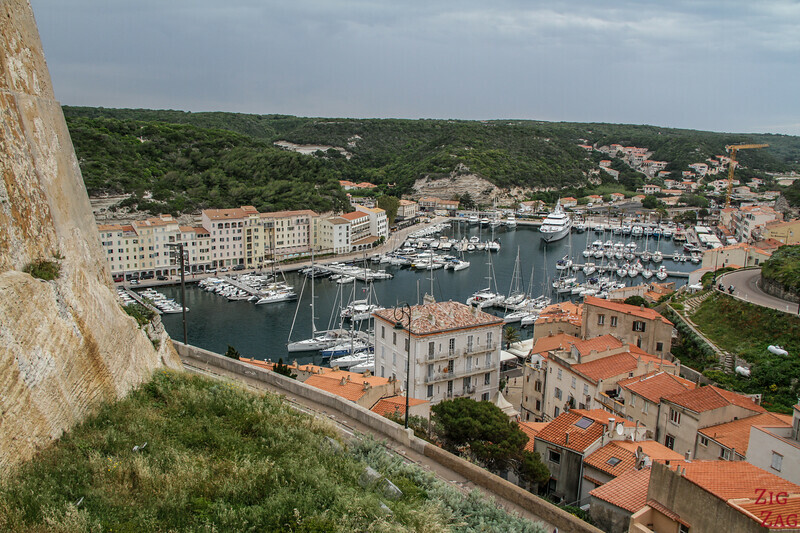 As you walk aout of the fortifications via the Bastion, you get a fantastic view of the lower Bonifacio and the Marina. The walk down is short but quite steep (paved path). 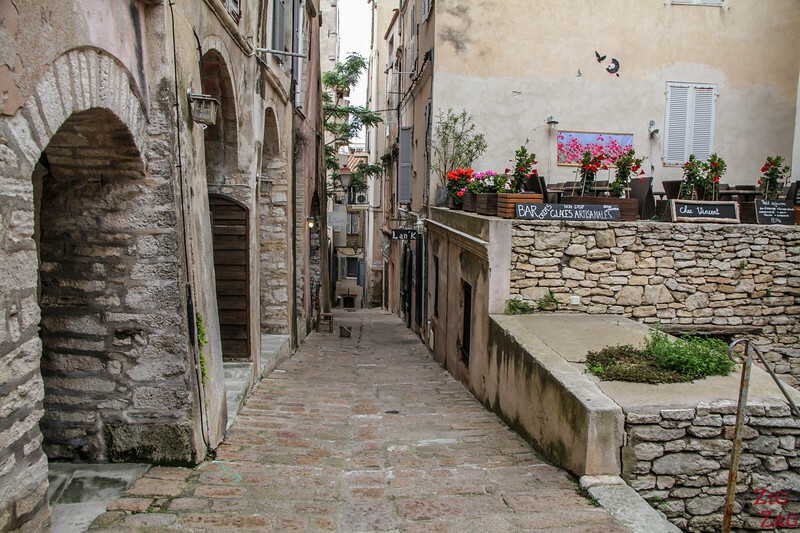 The old town is a great place to explore. My favorite part is at the end of the promontory with the views of the cliffs and the entrance to the harbour (see pictures in the previous section). That's because I prefer Nature. This is the oldest building in Bonifacio, dating back to the 12th century. Inside the church is not heavily decorated. And outside is the area called La Loggia where the 'older' member of the community used to meet to take important decisions for the town. I am normally not much interested in visiting cemetery. When you enter it is does not feel like a burial place. It looks more like a village with streets and rows of tiny houses. 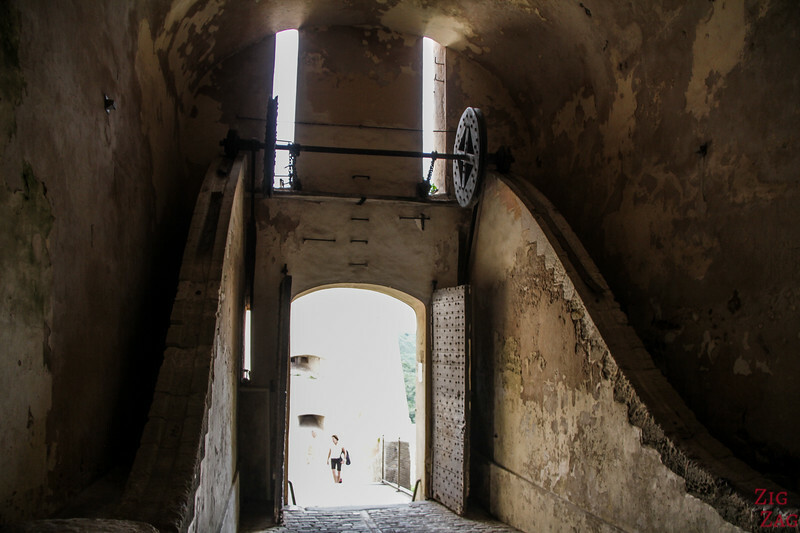 The official entrance inside the Citadel (when walking up from the marina) is quite impressive. The small door is nestled in the huge strong walls of the Bastion. It is still a drawbridge. This one dates back to 1830 when it replaces an older one from 1598. What an impressive way to enter the Citadel, don't you think? The old town is full of pubs and restaurant. 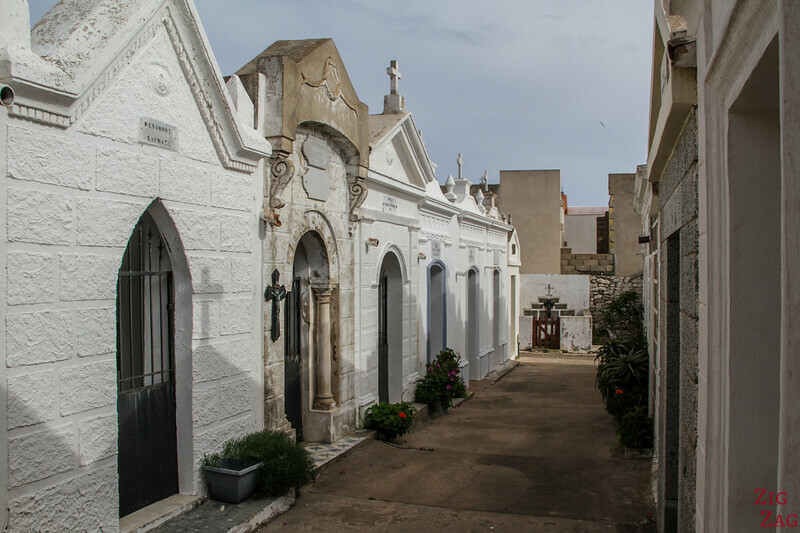 Take the time to wander those streets, find the old architectural elements and enjoy the vibe of this unique town. 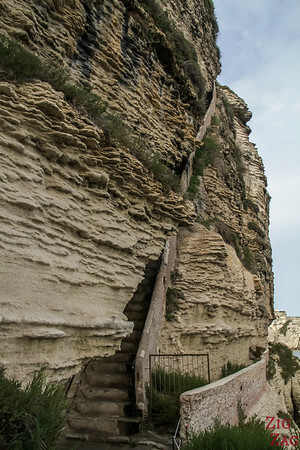 However the most famous activity in Bonifacio is to get down the Aragon staircase. I do recommend it. It is a rather unique experience! And it is considered the top thing to do in Bonifacio. What is the Aragon staircase? In french it is called "l'escalier du Roi d'Aragon". 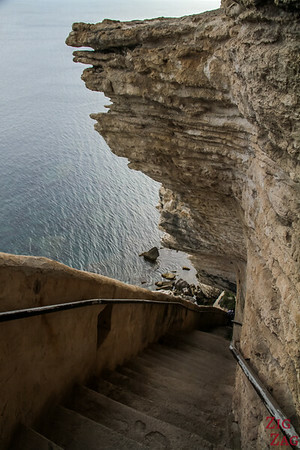 It is a staircase cut in the cliff to reach a walking path above seawater along the cliffs. It was established from a natural cut in the rock. There are 189 steps (187 original ones plus 2 to help). Steps are cut into the limestone and allow you to go down 65m. This way the locals can reach a place where fresh water can be collected. 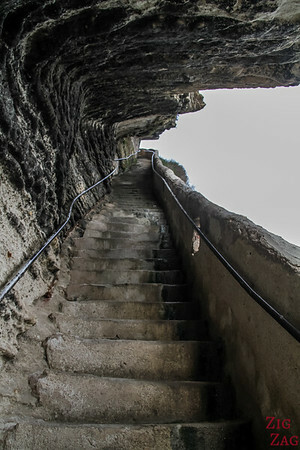 Since you go down 65m inside a cliff, the steps are really really steep, uneven and sometimes the path is quite narrow. It is very hard on the knees plus going down is not that easy for people with vertigo. And at the end of the visit you still have to walk up those stairs!!! I recommend visiting early morning or at the end of the day to have more space and cross path with less people. The legend says that in 1420, Alphonse V (King of Aragon master of Sardinia) wants to take over Corsica. Bonifacio was still not under his power and he decided to besiege the town. 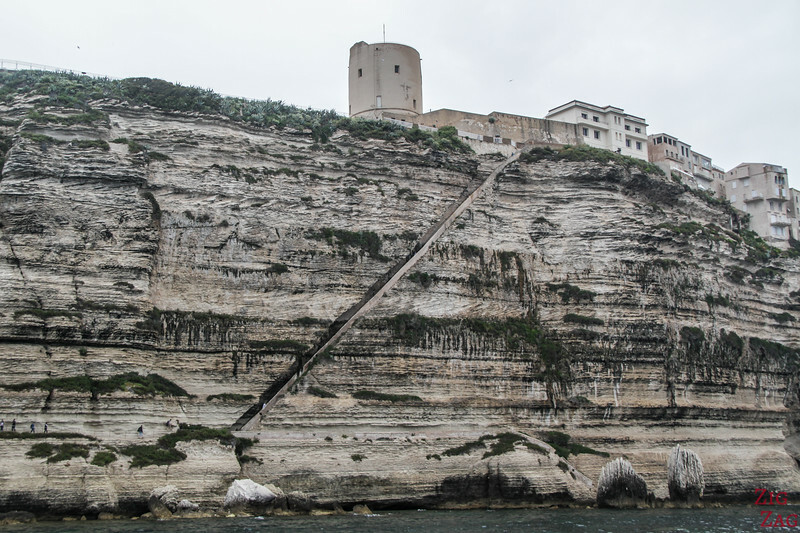 Facing strong resistance, the soldiers decided to build overnight a staircase in the cliffs. But as women were patrolling, they heard noises, rang the alarm and the attack failed. Alphonse went after other targets. Actually the rift in the cliffs has been there from time immemorial. And it has been shaped and improved overtime to become a real staircase. The Aragonais never used the staircase. But is was often used by the locals during sieges to collect fresh water. One of the best ways to realise how the staircase is set up is to see it from a boat tour around the cliffs. 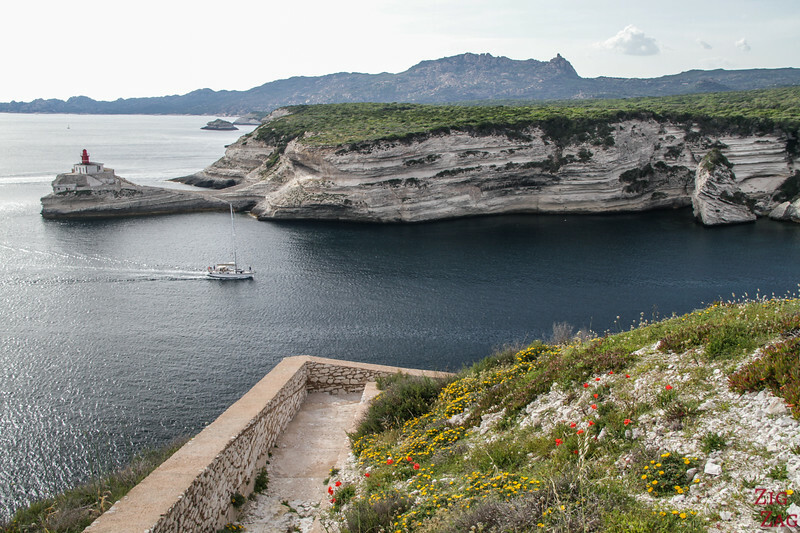 At the bottom of the citadel, protected by the promontory is the marina of Bonifacio. 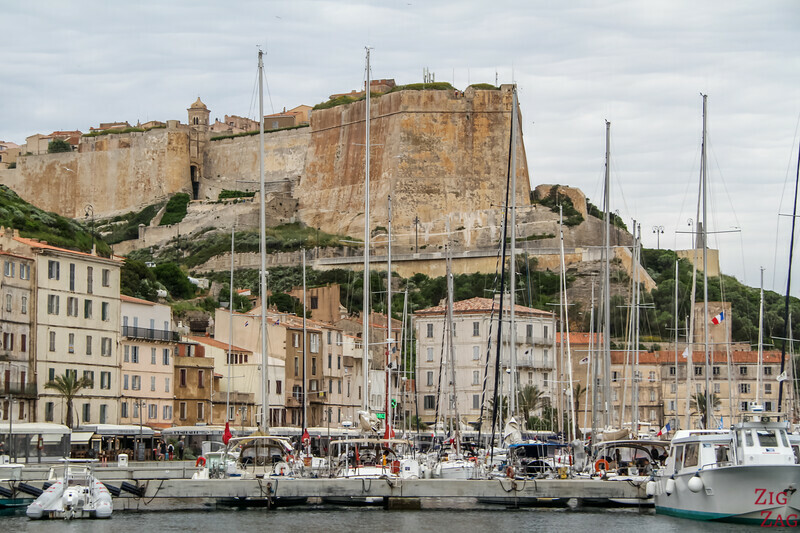 It offers great views of the Bastion and fortifications are well as a large choice of restaurants and shops. This is where the boats for the cliff tour and the Lavezzi islands depart. It is a very enjoyable place just to walk around. Thanks to its location it is sheltered from all winds. 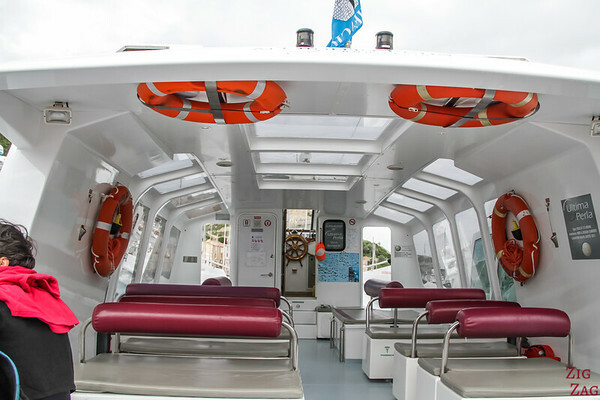 If you are arriving by boat your can learn more about the boat services here. 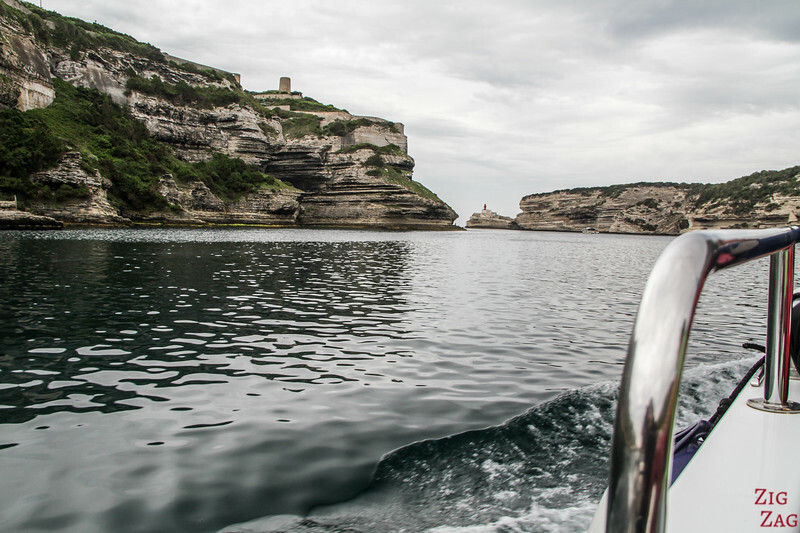 One of the other must-dos while in Bonifacio is to take a boat tour out of the harbour and along the magnificent cliffs. This is one of the best way to appreciate the unique situation of the town and to see the work of erosion that make the houses look like they are going to fall in water. Small boats take you for a 1hour cruise around the area. Part of the boat is covered. 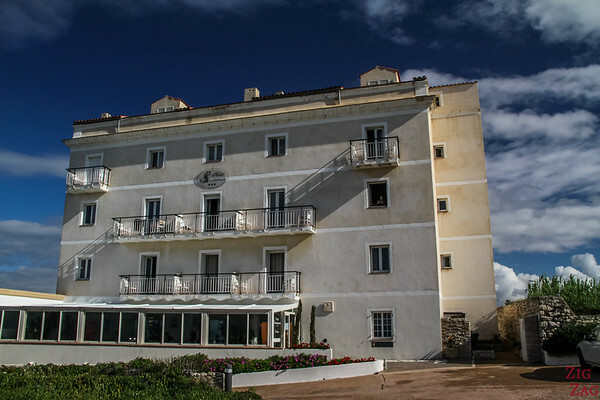 You first enjoy the views of the fortifications and the arm of sea between the land and the promontory. Once out of the sheltered harbour you get to admire the town from the sea with the layers of limestone sculpted by the elements. On each side of the mouth there are features to look at. 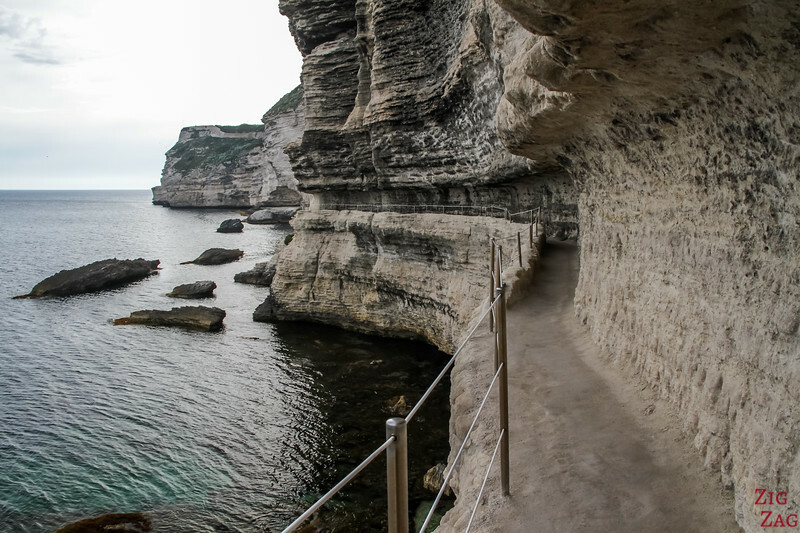 At the end of the promontory is a giant cave called the 'chapeau de Napoleon' which means Napoleon's hat. Above you can see the fortifications with people admiring the views I showed you earlier. On the other side the the Lighthouse of La Madonetta. I love the shapes of the rocks around it. Then you head West. If the sea is quiet you might get lucky like I was and enter a cave with a hole at the top that they say has the shape of Corsica. 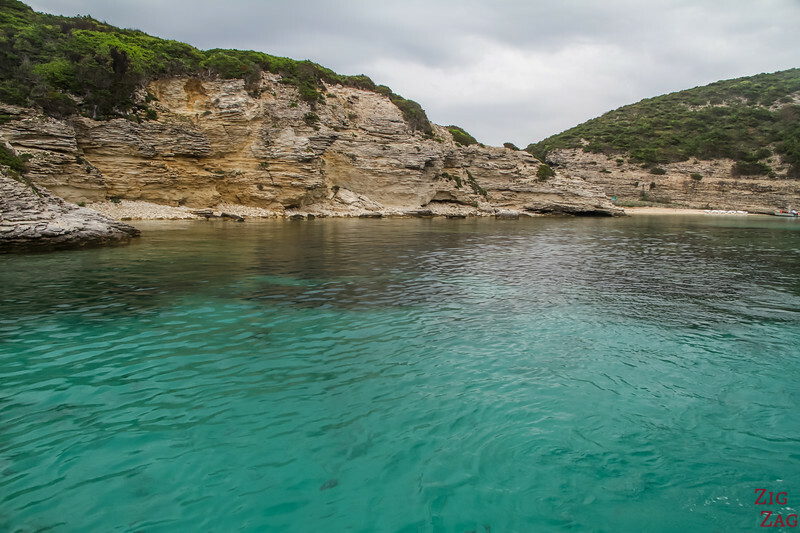 Then you enter little bays along the coast where you can find hidden beaches such as Plage du Fazzio. It those area the color of the water is splendid. The last point is the bay of Paraguan which is the limit between the white limestone cliffs and the granite plateau. From there, you will sail back to the harbor. The main company running those tours is SPMB. But there are a few others. You can purchase your ticket in one of the booths at the marina. 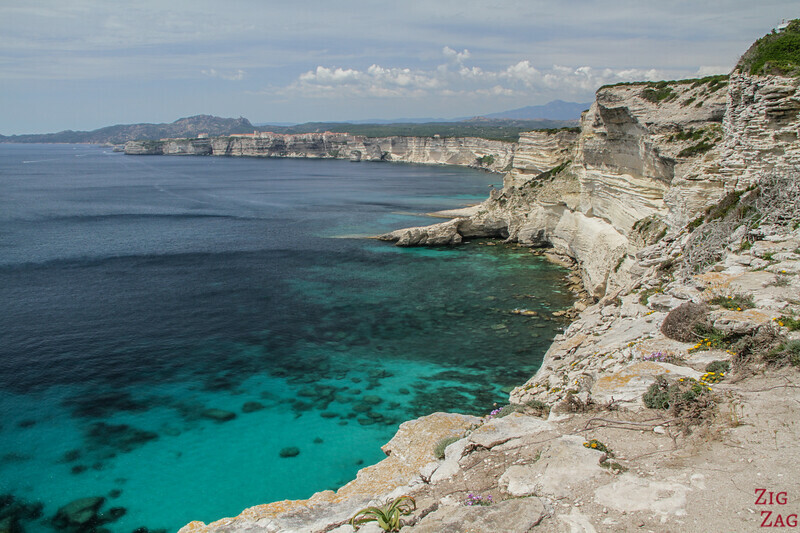 One of my favorite places in the Bonifacio Natural reserve is the area of Capo Pertusato. On the way there you get magnificent views of the town over the cliffs. On the way you can get really up-close views of the limestone and how it was sculpted by the elements. 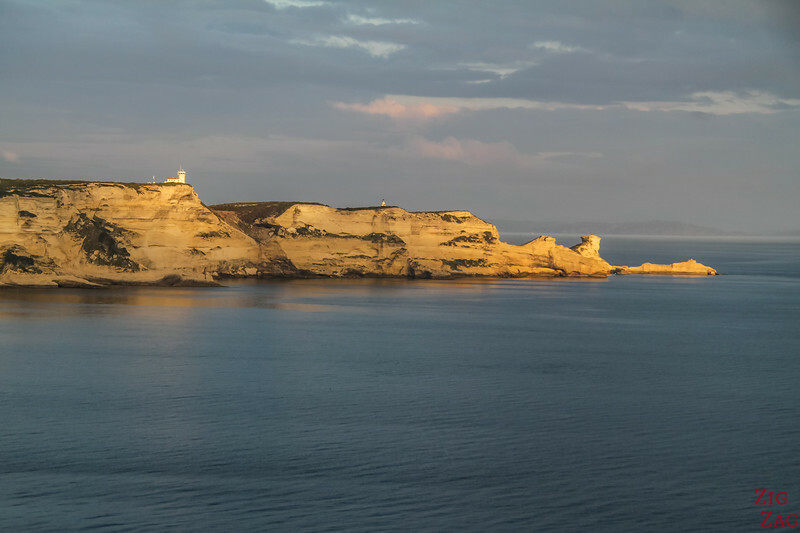 Once at the lighthouse, walk behind it on a small track to see the beach of Saint Antoine from above with its wreckage-looking rock formation. IF you have kids, be really careful as there are no protection and you are at the edge of cliffs. From the path to the lighthouse you can also make a turn on another path. It is a 15min climb down (not easy) to reach the magnificent beach of Saint Antoine. It is not your typical dreamy looking beach but it was still one of my favorite beaches in Corsica. The place really looks like another planet with only the sculpted cliffs. 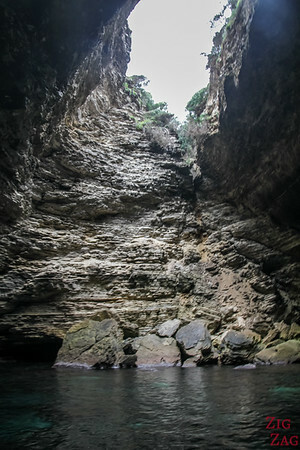 There are caves and giant holes to walk around. 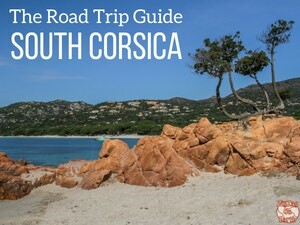 GPS coordinates of the carpark + practical info on my eBooks - The road trip guide Corsica and the South Corsica version. The town itself only has one beach and it is just a 2m2 of rocks down a staircase... 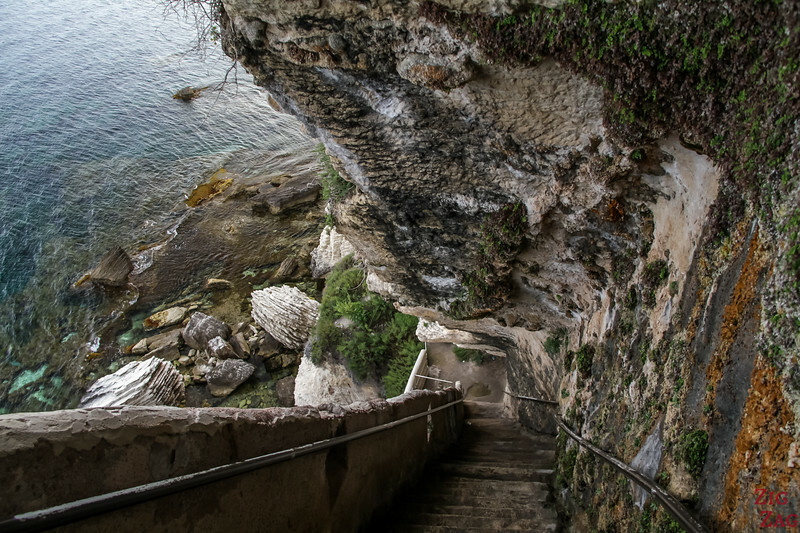 But it as a great view of the cliffs and the steps are a lot easier that the one at the Aragon staircase. The walk down starts at the bottom of the Bastion path. Across the promontory are also secluded beaches. They can only be reached on foot or by boat. The most famous is L'Arinella beach that you can see in the picture below (not to be mixed up with the one in Bastia that has the same name). 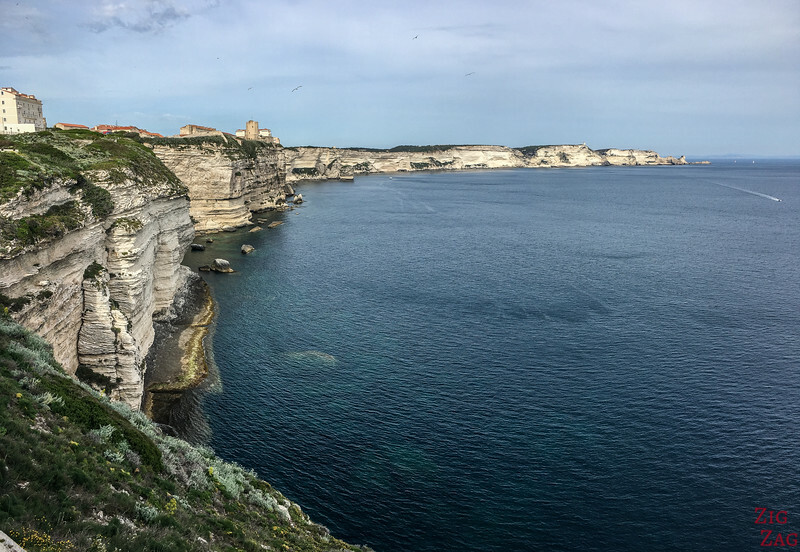 Whats else to do in Bonifacio? 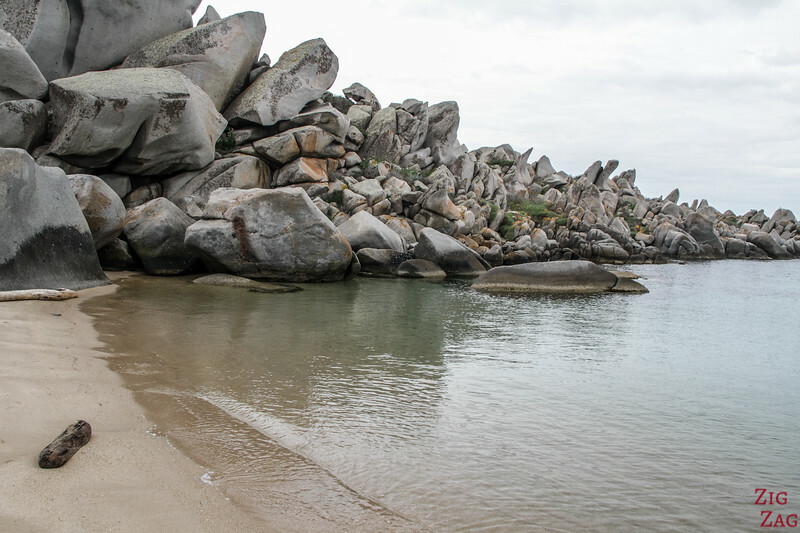 Head to the Lavezzi islands. 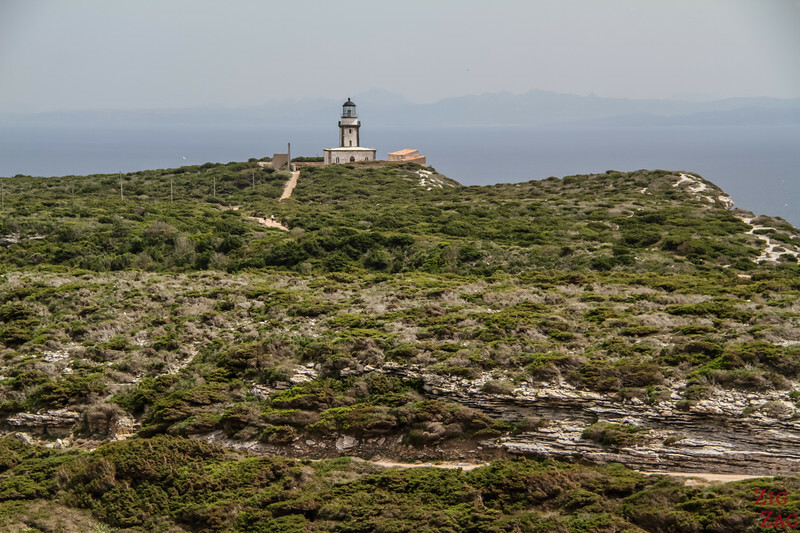 Another great activity to enjoy in Bonifacio is an excursion to the Lavezzi islands archipelago. 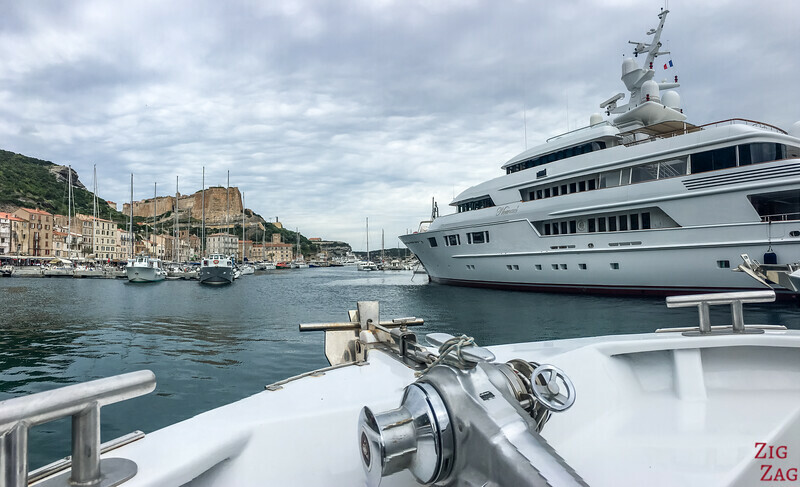 Boat tour departs from Bonifacio's marina. There are several departure each day and several returns. So you can choose how long you want to stay. The Lavezzi islands are a preserved area. 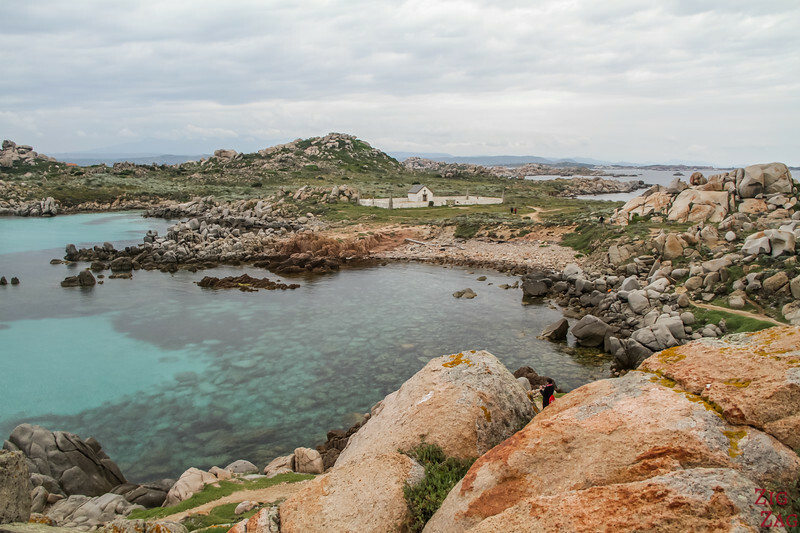 A small archipelago where the islands are covered by boulders of different colors, shape and size. This is a fascinating world! 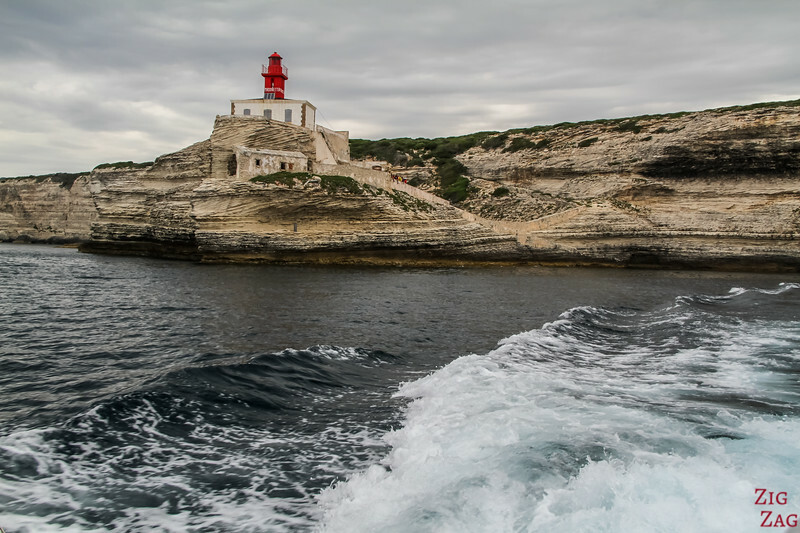 Is Bonifacio on your bucket list?